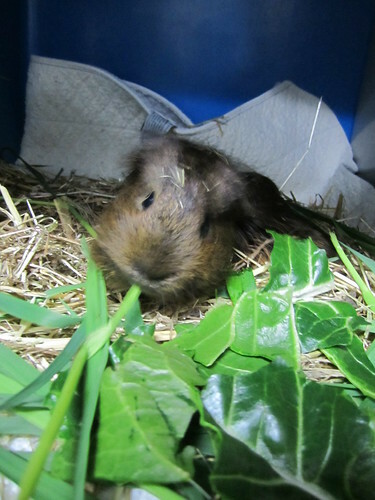 Today we were filled with sorrow because ‘Christopher‘, our famous guinea pig deteriorated in spite of all our efforts. He had improved over the first two weeks but since friday, he started to go downhill. Today, Erin & Dave, his god parents were horrified to see he had developed a pressure sore over his right hip and was losing clumps of fur around his rear. Erin had been extra judicious at checking him and bathing him regularly and giving him physiotherapy. He had also suddenly developed a swollen left forepaw. In summation, he seemed miserable. We all met at the clinic and after examining him, we looked at each other and knew it was time. Even though we were mentally prepared for this sad scenario, it still really hurt so much to come to this point. He had not lost his appetite and was still a food vacuum cleaner. We took advantage of that and each of us supplied him with a special treat and he happily inhaled each and every one of them. He had a very smooth send off to guinea heaven. Thank you Alana for coming in afterhours to perform the difficult deed. I simply chickened out and could not be the one performing the euthanasia because he felt like he was my own pet. We all consoled each other and knew it was the right thing to do. I especially felt for Erin and Dave who tried to put on a very brave face until the very end. Erin, thank you so much for all your hard work and giving ‘Christopher’ the best possible care. I can not tell you how much I appreciate you taking him on well knowing his prognosis was guarded and you were bound to get hyper-attached to this wonderful creature no matter what! 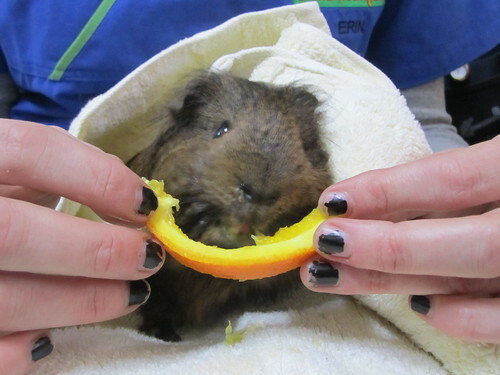 I tell you this little guinea pig would simply never stop eating and sought human interaction and was so affectionate. Personally, I think he is the most special one I have ever come across. He will be immensely missed. I leave you with his most recent pictures being pampered to the max. Aww!! This post made me cry! He was beautiful, and so lucky to be so loved! Rayya, I put on my bravest face, but I bawled like a child when I got in the car to go home…. and Dave had his moment when we got home. He definitely bonded very strongly with Dave. We are feeling a hole right now that he’s no longer “wheaking” at us from his hallway hutch. But we all gave him soooo much love, and a fighting chance. I’m going to leave it at that before I cry again. I am so sorry for the loss of your little friend! It’s amazing that something so tiny can leave such a large hole in our hearts. Dr. Raya, this post made me sad. My heart goes out to all involved. So sorry to hear about Christopher Rayya, but you all know in your hearts that you did your utmost best for him. He was such a character and will leave a gaping hole in many hearts; it’s incredible how even such a tiny little creature can affect us this way. Dr Rayya, you and your team are very brave and done a great job for the animals. God Bless!! I am only just catching up with Christopher’s story. I’m glad to hear he was so loved. Guinea pigs are such great little animals and Christopher is one of the best names for one I have ever heard!